Master Distributors does not warrant that the information provided by third parties for this website is precise, complete and up to date. The existence of inaccurate, incomplete or superseded information in this website will not cause Master Distributors to be in breach of the terms and conditions. Master Distributors retains the right to change, add or remove any material in or from this website without notice. This website may contain links to other websites operated by third parties (“third party websites”). Master Distributors does not control or own this information and is provided to you only for convenience. Master Distributors makes no warranties or representations in relation the content of Third party websites, the products or services offered through those sites. Master Distributors does not guarantee that this website or third party websites will be free from viruses, or that access to the website and third party websites will be uninterrupted. Master Distributors may suspend access to this website due to system faults or computer viruses. Master Distributors control and operate this website from Victoria, Australia. By using this website, you agree that this agreement is subject to the laws of Victoria, Australia. You further agree to submit to the non-exclusive jurisdiction of the Victorian courts and any courts of appeal determining any dispute arising from this agreement. By using this website, you agree to be bound by any revisions of this agreement. The applicable law is that of the State of Victoria, Australia, and the Commonwealth of Australia. For online orders we accept payment by credit card via PayPal or by customers’ PayPal accounts. If you do not have a credit card or PayPal account, please call +61-3-9538-9200, use this form, or email info@hudsonsprayers.com.au to place an order using an alternative payment method. We consider the security of your information to be of the highest importance. We will not sell your personal information to others. The information we collect will only be used to provide a specific product or service requested by you. 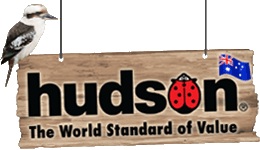 We have implemented security measures designed to provide you with peace of mind when purchasing goods from hudsonsprayers.com.au. PayPal always take reasonable steps to ensure that your payment details are secure and use sophisticated and proven technologies. All prices on this site are in Australian dollars (AUD) and include GST. All transactions are processed in Australian dollars. Prices listed on this website are subject to change without notice. All product information and descriptions on this site have been provided in good faith. While we make every effort to ensure the accuracy and correctness of the information on the website it is possible that some information may contain errors and omissions. Payment is required before any goods will be delivered. You will be liable for any shipping and handling charges. If a product is listed for an incorrect price, we reserve the right to refuse or cancel any orders placed. If credit card payment has already occurred, we will refund the amount of the order in full. Shipping costs, if any, are shown on the checkout screens while placing your order. Orders will be dispatched within 2 business days and shipping times are estimated at between 3-7 business days depending on your location within Australia. Delivery times may be slightly longer during peak periods. In the event that insufficient stock remains to fulfil your order, we will contact you within 2 business days of your order to advise you on how long it will take to source more stock, arrange an agreeable alternative item, or offer a full refund. If you wish to cancel your order please telephone us immediately on 03-9538-9200. However, if your delivery has already been dispatched please note that it cannot be cancelled. If you fail or refuse to take delivery of the goods you may be liable for all loss and damage suffered by us including all storage and handling costs and we reserve the right to charge a restocking fee of up to 25% of the purchase price. Please choose carefully because we do not accept returns for a ‘change of mind’. No cancellation or partial cancellation of an order by the Buyer shall be accepted by Master Distributors unless it has first been consented to in writing by Master Distributors and a cancellation charge has being paid which, as determined by Master Distributors, will indemnify Master Distributors against all loss, without limitation. Cancellation will not be accepted on goods that are not regular stock, which are in the process of manufacture or are ready for shipment.